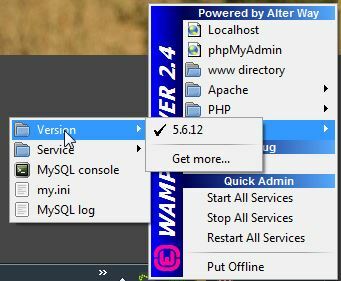 If you find that mysqld.exe in Windows with WAMPSERVER is using a lot of RAM, this may help. The mysqld.exe process is taking almost 500MB of RAM! So my table_open_cache is also not set in my.ini. My value happened to be at 2000. That answers that question. So why is table_open_cache so high? According to mysql, for MySQL version 5.6.12 or greater the default is 2000. There is the answer! I just happen to have installed MySQL 5.6.12 which set a table_open_cache of 2000 which, when using the calculation above set the table_definition_cache to 1400, which then used up about 500MB of RAM. For my fix, I just added table_definition_cache = 400 to my.ini and restarted MySQL. Now it takes about 95MB of RAM. My use of WAMP is fairly light, however, if you use yours heavily or keep a ton of data, you might fine tune these values to be more appropriate to your needs. Now I have a small table_definition_cache but still have a high table_open_cache. This may or may not cause issues in the future, but for now it’s just fine for a single user like me. It’s work properly Thank You.